The Templar Effigy lies in the Chapel of the Knights Templar in the grounds of the Rothley Court Hotel. Our project is to protect the effigy and plans are well in hand for an oak plinth with the design approved. This is subject to permission from the Rothley Court Hotel. 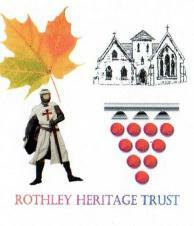 The Rothley Heritage Trust is pleased to report that written permission was given by the hotel in January 2011 to proceed with this project. We now need to raise £2,000 to achieve this and funding is being sought in February 2011. The good news is that the funds have been raised and the case is being made in October 2011. See below for the unveiling. With thanks to Neil Doogan, General Manager of the hotel and Greene King PLC for their support. 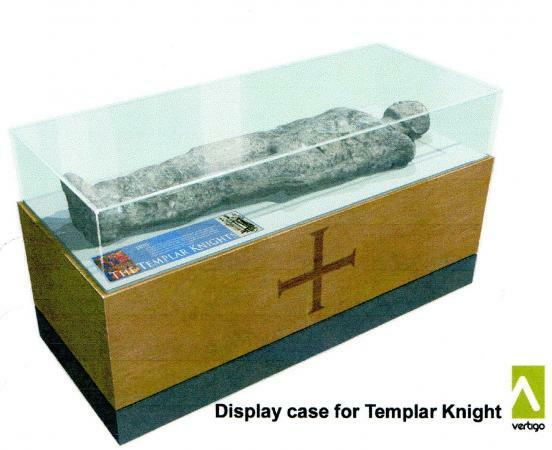 On the 22nd November 2011 the re-discovered effigy of a Master Templar was unveiled to reveal him laid in a beautiful presentation case in the Chapel of the Knights Templar at Rothley Court Hotel, formerly the Rothley Temple. 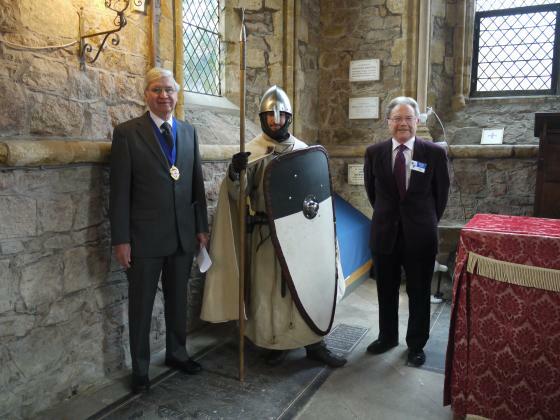 Ready to perform the unveiling is Percy Hartshorn, Chairman of Rothley Parish Council seen with Alex Smith as a Knight Templar and Brian Verity, Chairman of the Rothley Heritage Trust. Brian Verity tells the story of the finding of the effigy. 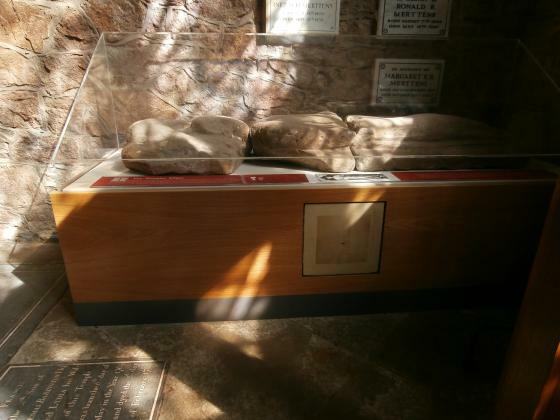 The five foot long effigy is thought to have been carved in 1250AD. 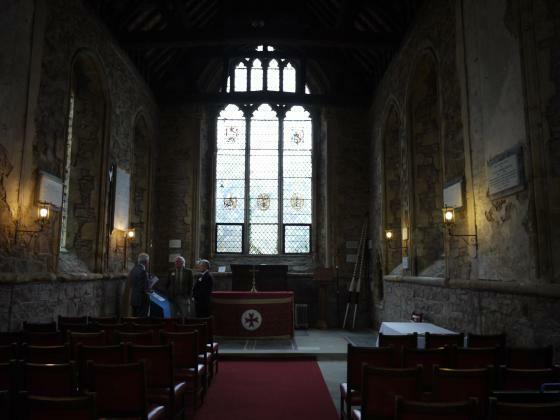 It was drawn and described in John Nichols "History and Antiquities of Leicestershire" and had had an insecure existence since 1567 when it was taken from Rothley parish Church to the cemetery. 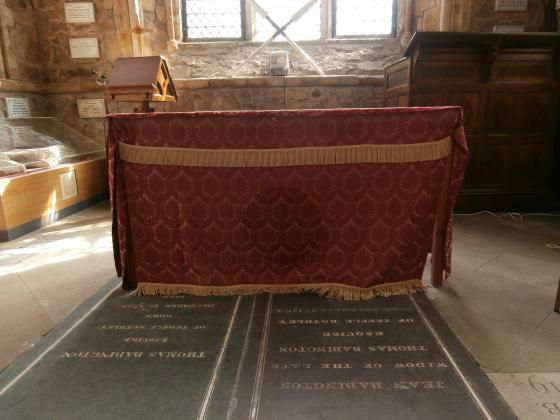 John Nichols discovered it in 1790 covered in weeds and it was replaced in the church by Thomas Babington, Lord of Rothley Manor. 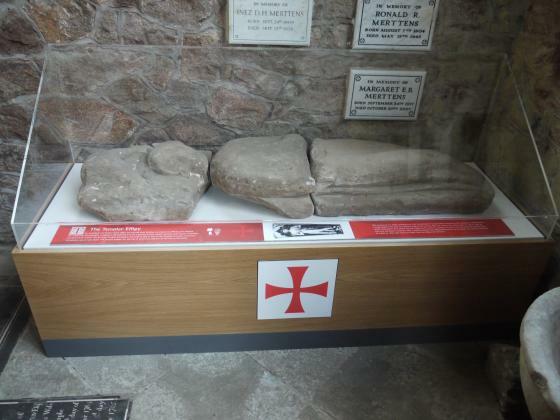 In 1876 the church was restored and the effigy moved into the entrance of the Chapel of the Knights Templar but it suffered yet another eviction at an unknown date to an unknown place. In 2004 Brian Verity, the Rothley Archaeological Warden, went on the trail of the effigy and discovered it in a rockery outside the chapel. It was rescued, cleaned up and the project to restore it forever was started by the Rothley Heritage Trust. 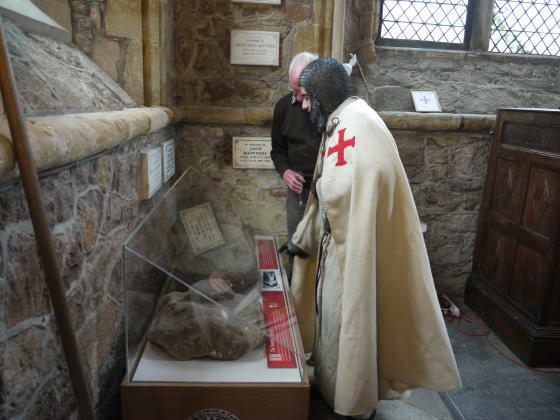 Alex Smith, the Knight Templar, looking at the effigy. The Templar Effigy laid to rest. After raising £2,00 the beautiful presentation case was commissioned by the Rothley Heritage Trust and made by Vertigo Creative Studio Ltd. The Templars are depicted as a poor order with two Knights having to share a horse. 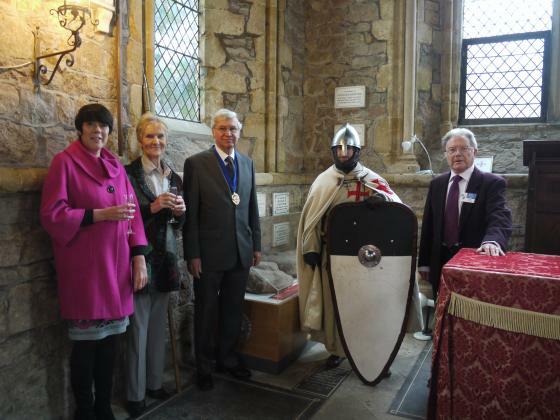 The main sponsors l.to r.
PLC, Susan Joyce, Chair of Rothley History Society, Percy Hartshorn Chairman of Rothley Parish Council on behalf of the Harry Hames Trust, Alex Smith as a Knight Templar and Brian Verity Chair of Rothley Heritage Trust. 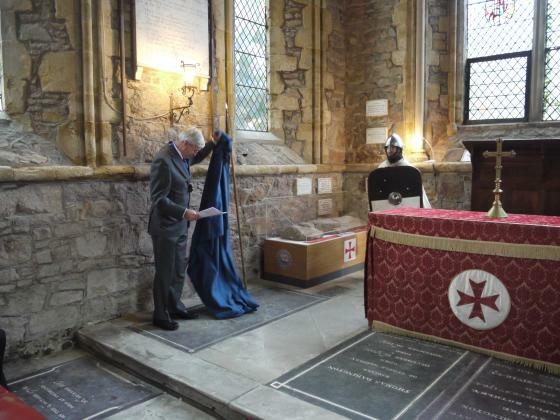 The Rothley Heritage Trust thanks everyone who donated to the Effigy Appeal to ensure that our Master Templar is laid to rest in his rightful surroundings of the Chapel of the Knights Templar. We would also like to thank the Rothley Court Hotel for their hospitality and refreshments on the day. 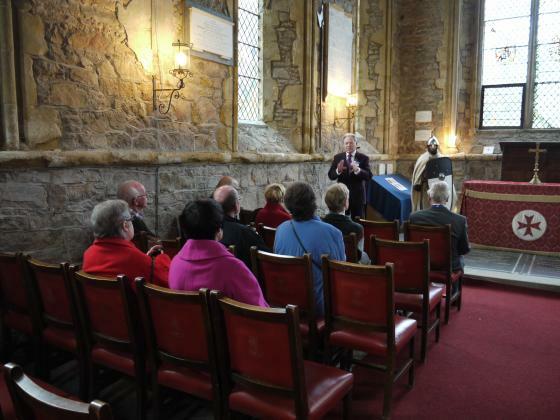 Sadly, the chapel is used for events and attracts those with no feeling for our history. 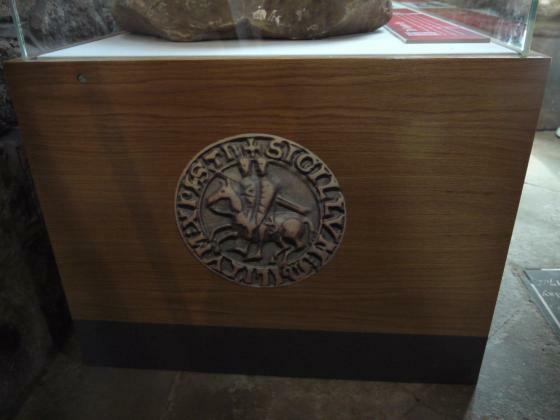 The Templar Cross was stolen in April 2013. It is being replaced. 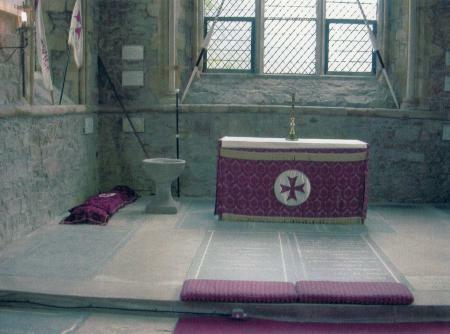 At the same time the Templar Cross was removed from the altar cloth. XHTML 1.0 validated. WCAG compliant. Page generated in 0.2158 seconds.